Smoothies are a great way to include plenty of nutrients in our kids’ diets. Smoothies are especially great for picky eaters who have a limited number of preferred foods. Adding sweet fruits to their smoothies masks the taste of vegetables. The perfect smoothie for a picky eater! When I make smoothies for my family, I load them with as much nutrition as possible because the perfect smoothie is not only yummy, but also loaded with nutrients. Here’s what I do: I always use a liquid, vegetables, fruits, healthy fats, and some extra ingredients. Let’s go through each of them so I give you a few examples of each. Once you have the theory down, you’ll be able to make a delicious and nutritious smoothie each time. Every respectable smoothie needs a base. No matter how powerful your blender is, it won’t be able to blend the solid ingredients without some added liquid to help the process. Since this past December, when I was gifted a Vitamix (which I have been wanting for years) by my hero (my husband I mean), I used various inexpensive blenders that did the job well. The last inexpensive blender we had was a Black and Decker and we had no issues with it for many years. Coconut water – this is my favourite liquid when making smoothies as unlike simple water, it has electrolytes, vitamins, minerals, etc. I use coconut water around 90% of the time. A good example is Coconut grape chocolate smoothie. Coconut milk – this is my second favourite liquid I use that has the added benefit of healthy fats. A smoothie with coconut milk is Kiwi banana avocado smoothie. Almond milk – I make this by blending water and a few tablespoons of almond butter (my ratio is 1 cup water to 2-3 tablespoons of almond butter). Water – I don’t use water as I prefer to use coconut water instead for its powerhouse of nutrients. Fruit juice – I rarely use fruit juice in my smoothies as I don’t have juice on hand in the house. You can use a store-bought fruit juice or if you have a juicer, you can make one on the spot. Here’s a smoothie made with homemade apple juice: Delicious smoothie that helps your child poop 😉 . Tea – rooibos, green, mint, etc. Yogurt or kefir – my son can’t have dairy so I avoid using yogurt and kefir. If this isn’t a problem in your house, these are great options as a liquid base for smoothies. All the smoothies I make have at least one vegetable. The 2 vegetables I use most often are green leafy vegetables: kale and spinach, fresh or frozen. A yummy example is Kale kiwi avocado smoothie. If you are feeling really adventurous, add beet greens or dandelion greens. Adding fruits make a smoothie palatable to picky eaters. Fruits mask the taste of vegetables and sometimes the color too. For example, yesterday I made a smoothie with mixed berries and spinach. No one could tell it had spinach. The purple-red color of berries masked the green color. Bananas – I put bananas in all my smoothies. Berries – strawberries, blueberries, raspberries, and blackberries are all great additions to any smoothie. Cherries – I love cherries and they often show up in my smoothies (Cherry strawberry smoothie). Watermelon – although it’s seems that finding a sweet watermelon is eluding me. Of course, you can use any fruits you like. You can’t go wrong with any of them. Avocado – although it’s technically a fruit, I added it to the healthy fats category as it’s rich in monounsaturated fats. It’s also rich in fiber and folate. Walnuts – I don’t blend them, I add them to the each glass before we eat the smoothie. You can use any nuts you like. They add not only flavour, but also nutrition. Ice cubes – if you prefer your smoothie cold, add a few ice cubes. Alternatively, you can use cold liquid or frozen fruit for the same effect. So there you have it, my comprehensive list of awesome ingredients for making a perfect smoothie that is delicious and full of nutrition. Choose at least one ingredient from each category, blend until smooth, and enjoy your smoothie! My family and I like to top ours with walnuts for a delicious crunch. The best thing about smoothies is that you can choose your favourite ingredients and include as much nutrition as possible in each smoothie you make for you and your family. Delicious and nutritious – the best combination! 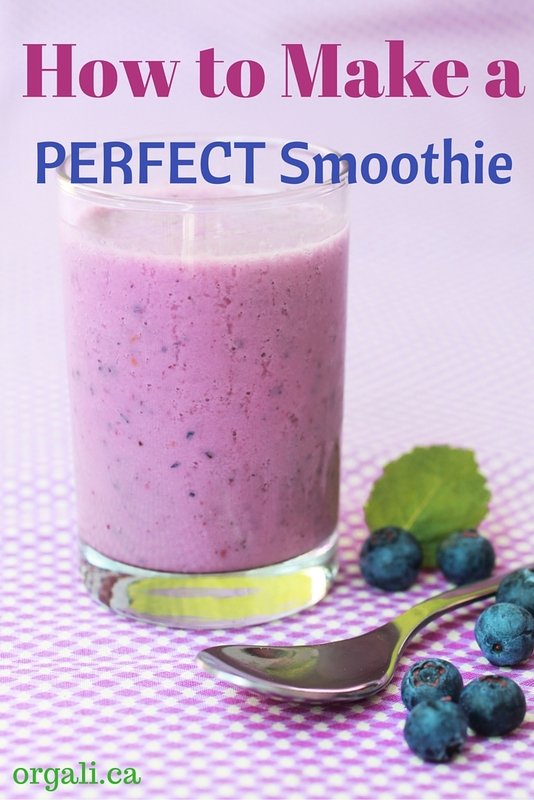 I would LOVE to know what are YOUR ingredients to make a perfect smoothie. Please share with all of us!